Lamb on its own is a flavorful alternative to traditional burgers. It’s also a perfect vehicle for interesting seasonings, from simple garlic and rosemary to anchovies and caper. Grilled lamb burgers lend themselves beautifully to various additions, from rosemary and garlic to bell peppers and capers. Though hamburgers reign supreme in the burger landscape, they can amount to mere condiment conveyances. Grilled lamb burgers, on the other hand, entice me with the rich, complex flavor of the meat itself. That doesn’t mean that flavor accents aren’t welcome; in fact, the distinctive flavor of lamb lends itself beautifully to various additions. Here seasonings run from simple garlic and rosemary to more elaborate combinations, such as anchovies and capers, broccoli rabe and pecorino Romano, whole-grain mustard, harissa and North African spices, and sun-dried tomatoes. Just hold the ketchup. Ground lamb is especially prone to flare-ups on the grill, so keep an eye on the burgers and, if necessary, move them to a cooler part of the grill until flares die down. I like lamb burgers cooked to medium-rare; an extra minute or two on the grill will bring them to medium, if you prefer. In a small skillet over medium heat, heat the oil until shimmering. Add the onion and a small pinch of salt and cook, stirring, until softened, about 4 minutes. Add the garlic and rosemary and cook, stirring, until fragrant. In a large bowl, break up the ground lamb into rough chunks. Add the onion mixture, 1½ teaspoons salt, and 1 teaspoon pepper, and toss lightly with your hands to thoroughly distribute the seasonings. Divide the mixture into six 6-ounce portions and, with a light hand, gently form the portions into patties roughly 4 inches in diameter and 1 inch thick. Press a divot into the top of each patty, if desired, for a flatter top after grilling. Refrigerate, covered, until ready to grill. Prepare a medium-hot fire in a charcoal grill or preheat a gas grill on high for 15 minutes. (If using gas, adjust burners to medium-high and grill with the lid closed.) Clean and oil the grill grate. Grill the burgers, undisturbed except to deal with flare-ups if necessary, until grill-marked on the bottom, about 4 minutes. 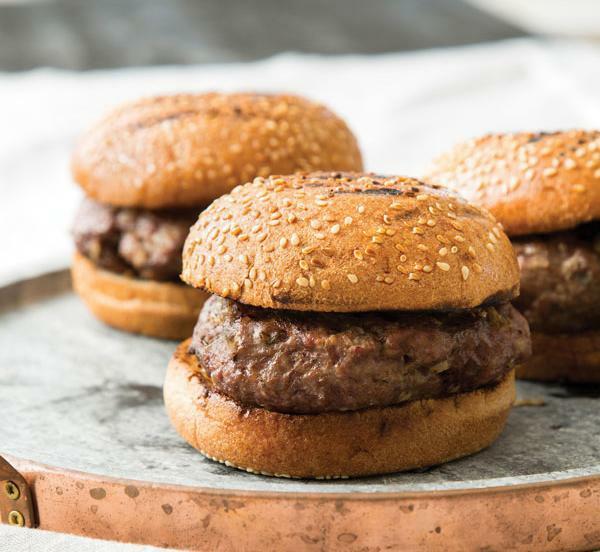 Flip the burgers and continue grilling until the meat is medium-rare, about 3 minutes longer (125 to 130 degrees on an instant-read thermometer), or medium, about 4 to 5 minutes longer (135 degrees on an instant-read thermometer). Transfer the burgers to a plate and let rest for about 3 minutes. Meanwhile, grill the English muffins, buns, or bread, cut sides down as necessary, until lightly browned, about 3 minutes. Place each burger between slices and serve at once. 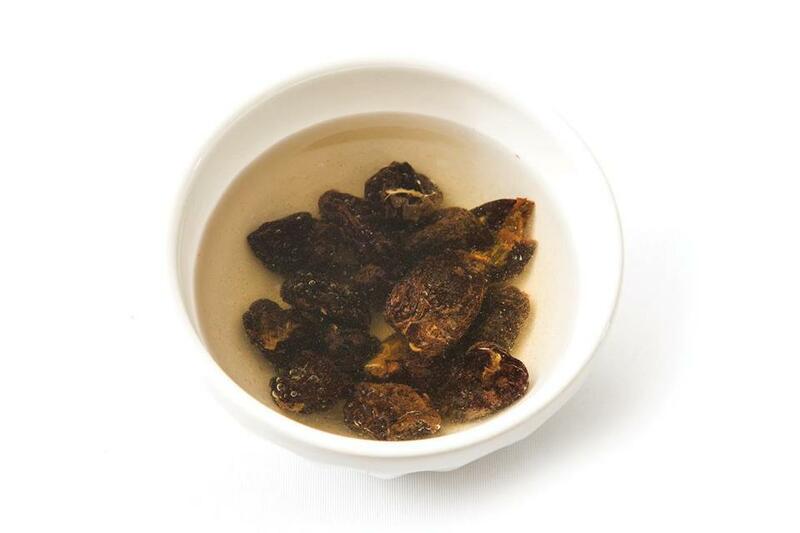 Soaking dried fruit before adding it to other ingredients is a common technique. In the recipe with grainy mustard and prunes, soaking the prunes briefly softens them so they won’t be chewy in the burgers. 1) Substitute one small red bell pepper, cored, seeded, and finely chopped, for the onion. 2) Omit the garlic and rosemary. 3) Decrease the salt to ¾ teaspoon. 4) Along with the sauteed red pepper, mix 1½ tablespoons minced anchovies (about 9 medium-small fillets, preferably oil packed), ¼ cup capers, rinsed and chopped, and ½ cup chopped fresh parsley into the ground lamb. 1) Place a colander in the sink. Fill a large bowl with ice water and set aside. In a medium saucepan, bring 1 quart of water to a boil. Add ½ teaspoon salt and ½ pound broccoli rabe (about half of a medium bunch), thick ends trimmed, and cook until just wilted, about 1 minute. Drain the broccoli rabe, place it in the ice water, allow it to cool for about 2 minutes, and drain again. Squeeze the broccoli rabe to release extra liquid, chop it fine (you should have about 1 generous cup), and set aside. 2) Substitute the chopped broccoli rabe for the onion and 1 teaspoon red pepper flakes for the rosemary. 3) Decrease the salt to 1 teaspoon. 4) Along with the broccoli rabe mixture, mix ¾ cup finely grated pecorino Romano into the ground lamb. 1) In a measuring cup or bowl, cover 15 pitted prunes, halved (about ¾ cup), with water and microwave just long enough to warm, about 1 minute; set aside for the prunes to soften, about 30 minutes. Drain the prunes, blot dry with paper towels, chop them, and set aside. 2) Omit the garlic and substitute 2 tablespoons minced fresh thyme for the rosemary. 3) Along with the onion mixture, mix the chopped prunes and 3 tablespoons whole-grain Dijon mustard into the ground lamb. The spices here suggest, but are milder than, merguez, a boldly spiced lamb sausage of North African origin. 1) Before sauteeing the onion, in a small bowl stir together 2½ teaspoons paprika, 1 teaspoon each ground cumin, ground coriander, and ground fennel, and ¼ teaspoon cayenne to mix. 2) Substitute the spice mixture for the rosemary. 3) Decrease the salt to ¾ teaspoon and omit the black pepper. 4) Along with the onion mixture, mix 3 tablespoons harissa into the ground lamb. Freshly ground black pepper is essential here. 1) Substitute 2 tablespoons minced fresh thyme for the rosemary. 2) Increase the pepper to 1 tablespoon. 3) Along with the onion mixture, mix ⅔ cup sun-dried tomatoes, preferably oil packed, drained, dried, and chopped (about ½ cup) into the ground lamb.